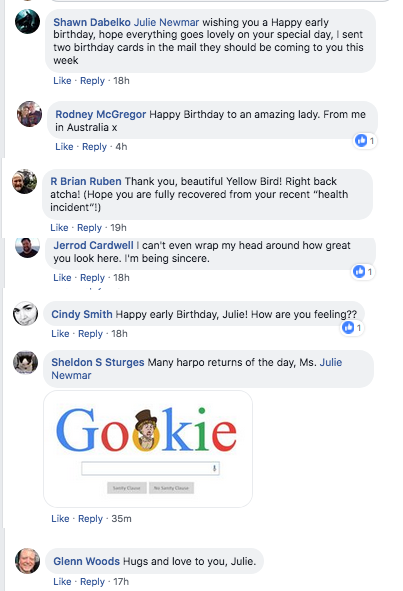 It's always a joy to see how fans call attention to themselves on Facebook. They outdo each other in wanting to be noticed for their devotion! 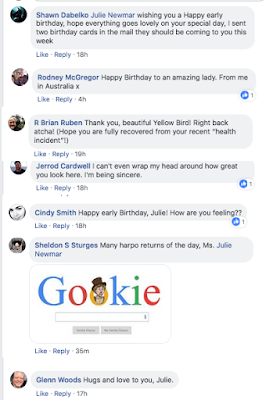 Dozens upon dozens of birthday thoughts have come in, and so many of them are phrased if they know Julie personally. That's a form of magic. Most people know Charlotte Rae from her sitcoms "Dif'rent Strokes" and "The Facts of Life." 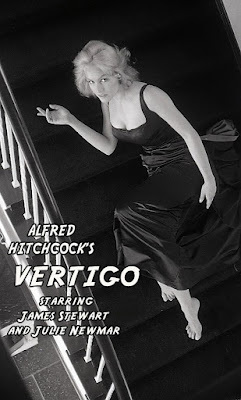 She perfected her comic skills after arriving in New York City in 1948...working in cabaret, developing her own nightclub act of sophisticated comic songs, and...making an early splash in the same show that launched Julie Newmar: "Li'l Abner." Julie's "Stupefyin' Jones" character was easily the most talked about on Broadway, and pictures of her appeared in dozens and dozens of magazines. But that show was loaded with talent, and Charlotte Rae had audiences roaring with her feisty performance as excitable Mammy Yokum. This was well before Irene Ryan's famous "Granny" role on "Beverly Hillbillies." Yes, Charlotte was amazing in this rural role...moreso when you consider that before this, she'd been on Broadway in "Threepenny Opera," and after, took roles ranging from hapless housewife Mrs. Schnauzer (on "Car 54 Where Are You") and a neurotic Tupperware saleslady in a memorable episode of "All in the Family." That one so impressed Norman Lear, that he cast her in "Dif'rent Strokes." Charlotte did so well with that show, and the sequel, that she had the luxury of picking and choosing challenging roles in the 80's and 90's. These included everything from an episode of "Murder She Wrote" to another surprise, the lead in a Chicago stage production of "Driving Miss Daisy." She passed away on August 5th, at the age of 92. 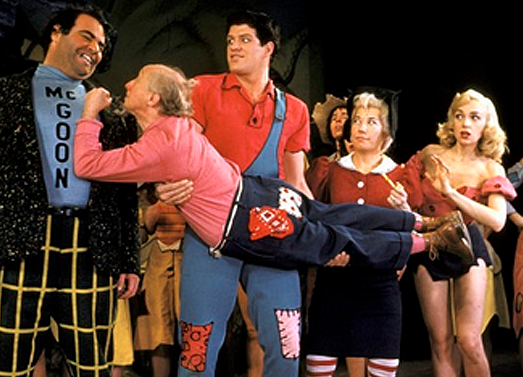 Here's a scene from the original Broadway version of "Li'l Abner"